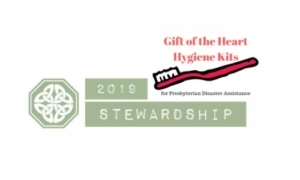 “Gift of the Heart” Hygiene Kits. The kits would be collected and sent to areas where disaster strikes, much like we’ve recently witnessed with Southeastern hurricanes and California wildfires. We began to talk up this project first in our Congregational Care Team and with the director of The Gardens, Tammy Caldwell. All seemed to think it was a good idea. Soon we had volunteers who helped gather the supplies of hand towels and wash cloths, soap, toothbrushes, combs, nail clippers and the gallon zip lock bags to contain them. With Tammy’s help, the hospital and The Gardens provided the band aids and toothpaste. Among the other blessings that have resulted from this very small project is that our youth group was inspired to pack kits here at church. Once a national company donated items. Discounts have been given us on supplies and, as reserved Presbyterians, we’ve “accidentally” witnessed in Dalton stores, as employees always want to know what we’re doing with all those combs! Now, almost three years later, we’ve packed over 1,000 kits of hope-in-a-zip-lock-bag.